Indiana State University’s Cunningham Memorial Library has added another rare dictionary to its esteemed Cordell Collection. 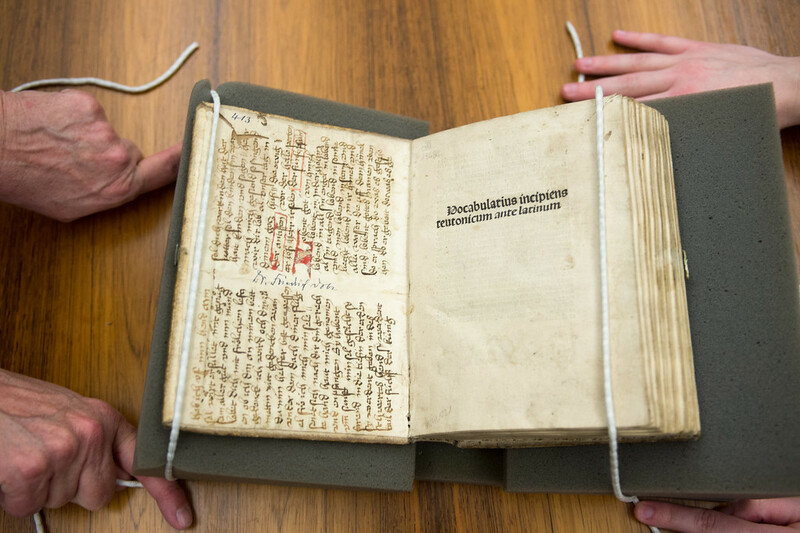 One of the first known examples of a German-to-Latin dictionary, “Vocabularius incipiens teutonicum ante latinum” was published in 1495 by Johann Gruninger. The small quarto still bears its original binding and has few blemishes. “The book itself is wonderful. It’s the only copy of this book in the United States,” said Cinda May, chair of the special collections department at the library. The 382-page dictionary is unpaginated, but it was hand-numbered in ink, presumably by an owner. 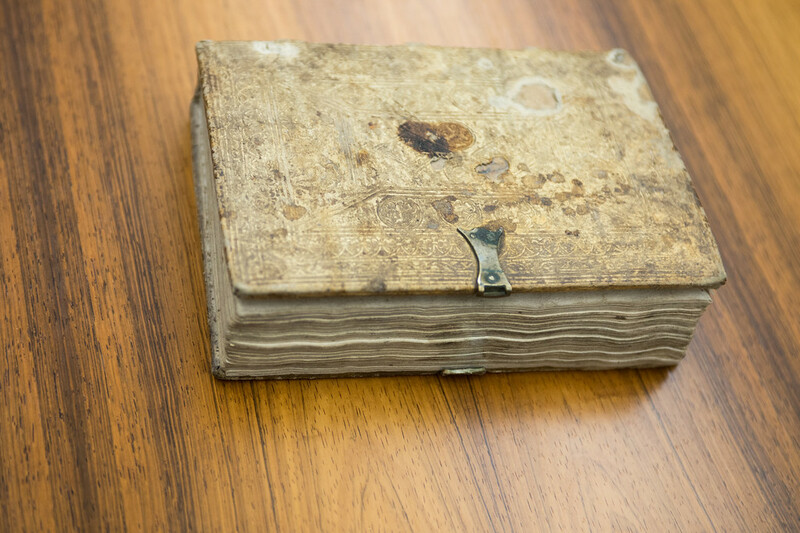 The incunable dictionary — a term referring to one printed before 1501 in Europe — is bound with a pigskin cover by the Augustinians at the Ulm monastery of St. Michaels. Its “pastedowns are as white as newly fallen snow,” with manuscript ink and rubrication “so pristine as if they were created in our own time,” said David Vancil, curator emeritus of the Cordell Collection. Vancil saw “Vocabularius” for sale in a bookseller’s catalog and contacted May, who had overlooked the entry. May happened to have money in her acquisitions budget and made the purchase — an especially important one, considering the book’s rarity, May said. “It surprised David, because he was joking,” she said. 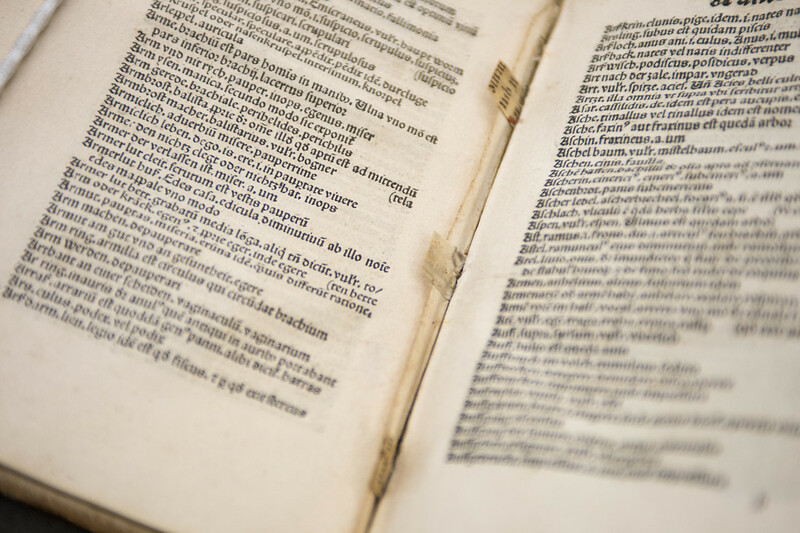 The Cordell Collection of Dictionaries, Word Books and Philological Texts is open to the public and provides a unique opportunity for people to see artifacts from the first days of printing. The bookseller, Bruce McKitterick, said he was pleased “Vocabularius” found a home in the Cordell Collection, as McKitterick’s father assisted Warren Cordell in its creation, May said. “Vocabularius” features a Gothic typeface but is considered to be visually plainer than many German books of the era — a quality that aids readability. “This work is worthy of study by historians of the development of book production, including the creation of inks, paper and the printing itself — all coming a short 40 years after Gutenberg’s 1455 Bible,” Vancil said. While the author of “Vocabularius” is anonymous, experts presume it was written by a teacher, likely affiliated with the church. “Of course, one outcome of such a book would have been to help create dominant usages and spellings, so it’s likely that this dictionary exerted influence in both establishing dominant spellings for German words and in developing subsequent dictionaries, not only in German but in other languages,” Vancil said. This specimen is also unique regarding the organization of words, as bilingual dictionaries of this time normally would have listed the Latin or Greek term first. The tome also provides some social context for the people of that era. For example, one unexpected definition is for pancakes fried in blood. In the age of Twitter, Facebook, and Social Media all vying for your attention, the news has become even more sensationalized and focused on catching your eye. Learning to tell the difference between fact and perception is essential to understanding “risks” and maintaining health. This interactive talk is designed to help you navigate these difficult topics and find useful information to be more informed about your health and safety. Community people: remember, parking is free on campus after 5pm in any lot. Lot closest to library off of Tippecanoe, near Student Rec Center. She volunteers time to her church, every charitable event on campus and is constantly helping with the United Way. She is one of the few people that is always upbeat, always looks for the best in people and always helps anyone and everyone. She’s a compassionate, caring person who spends her time spreading joy to everyone and is an excellent motivator to get others involved and make a difference. Congratulations, Beverly Grubb, January’s ISU Difference Maker of the Month. In the Fall 2014 State magazine article about the renovation of Normal Hall, Josh Powers and Linda Maule were quoted as saying that housing the Student Success Center in the building would allow it to serve as one of three anchors of a student success corridor, with the other anchors being Cunningham Memorial Library and the university’s Career Center. Information literacy is at the heart of Cunningham Memorial Library’s student success effort. The ISU community is invited to find out more about this vital component of higher education with a presentation, Information Literacy in the “Pathway to Success” with special guest speaker Sharon Weiner, Professor and W. Wayne Booker Chair in Information Literacy at Purdue University. Dr. Weiner received her doctorate in higher education leadership and policy from Vanderbilt and her MLS from the University at Buffalo. She will explore how information literacy contributes to college student success. She will give examples of how other universities coordinate information literacy initiatives and will illustrate with practical and effective strategies. 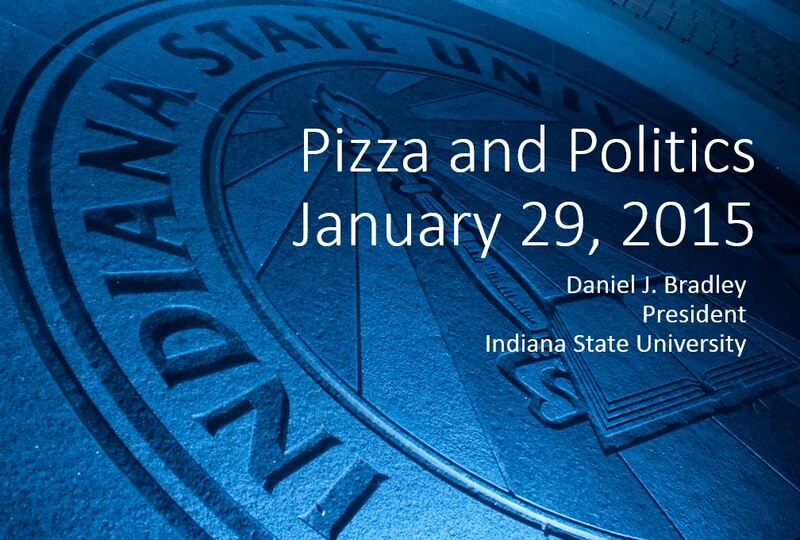 Finally, the speaker will suggest ways that information literacy can continue to bolster strategic initiatives at Indiana State University. The presentation on Wednesday, January 28 will begin at 2:00 pm in the Events Area at Cunningham Memorial Library. A reception, prior to the presentation, will begin at 1:30 in the same location. Karen has also submitted an invited review on the Center for Jewish History to College and Research Libraries News. 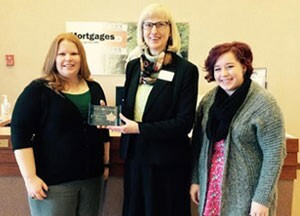 Karen has been one of our most steady contributors to scholarship since she came to us in 2000. In addition to her other responsibilities, she is the Government Documents subject specialist. Search our blog for more entries. Are you concerned about the cost of education today? The American Democracy Project are sponsoring event discussions about the current cost of education, and what can be done to change the current educational system. Pizza and refreshments will be available at the event. The American Democracy Project will be sponsoring a State of the Union Tweet up on 8:45 p.m. Jan. 20 in the Cunningham Memorial Library Events Area. The event will feature a live telecast of the President’s State of the Union address. In addition, students will be encouraged to join the national conversation on Twitter during the speech. Twitter will be streamed live at the event. Refreshments will also be available.